Vigilante groups in the troubled Mexican state of Michoacan have entered a stronghold of the Knights Templar drug cartel, occupying the main square. Hundreds of vigilantes, backed up by armoured vehicles and troops, arrived in Apatzingan on Saturday. They have also set up roadblocks around the city, in western Mexico. The cartel controls much of the drug trafficking in the area, carrying out killings and kidnappings and extorting money from local people. Vigilante leaders, who have joined the official security forces, and the army have been searching house by house for leaders of the Knights Templar. Some arrests have been made, including the brother of one of the organisation's top leaders, according to local reports. The vigilantes "will be in charge of security in Apatzingan", Michoacan deputy government secretary Fernando Cano told AFP news agency. In the beginning of January, the "self-defence groups" launched an offensive against the Knights Templar gang, taking over several municipalities in Michoacan. On 11 January, they also occupied the central square of Apatzingan, where the cartel's command is based. But there were reprisals, with arson attacks against local businesses. The new operation began just before 11:00 local time (17:00 GMT) on Saturday. 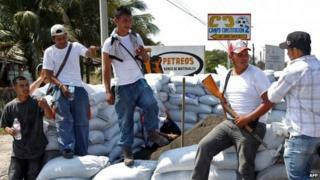 The vigilantes, federal police and soldiers walked unchallenged into the centre of Apatzingan. Checkpoints have been set up along several access routes to the city "to check who goes in and out," said vigilante leader Estanislao Beltran. The strategy has been agreed between the vigilante leaders, army and police officers and President Enrique Pena Nieto's envoy to Michoacan, Alfredo Castillo. On Friday, one of the vigilante leaders, Hipolito Mora, said the occupation could not be delayed any longer. "We need to enter Apatzingan, which is the heart of the whole region and, as we all know, of vital importance for the criminal organisation," said Mr Mora. "There can't be any further delay, as that would put under risk the lives of so many people who are supporting our movement," he added. The Knights Templar cartel has accused the vigilantes of working as a proxy army for the New Generation cartel, from neighbouring Jalisco state. The two rival organisations have been fighting a turf war for control of criminal activities in Michoacan and Jalisco. But the vigilantes have fiercely denied any involvement with the New Generation cartel. They say they have taken matters into their own hands as the Mexican government has failed to guarantee the security of their families. More than 70,000 people have died in drug related violence across Mexico in the past six years. On Thursday, police found a mass grave with some 20 bodies in the Michoacan town of Tinguindin. Hours earlier, four bodies in plastic bags were found in the nearby village of Zacan. They were left outside the local church, accompanied by a threatening note. A spokesman for the vigilante groups said the killings were probably a revenge attack carried out by the Knights Templar. Are you in Michoacan? Are you affected by the issues raised in this story? You can send us your comments and experiences using the form below.